Last September 2017, Hurricanes Irma and Maria hit Puerto Rico, knocking out critical infrastructure and ransacking the island’s forests. 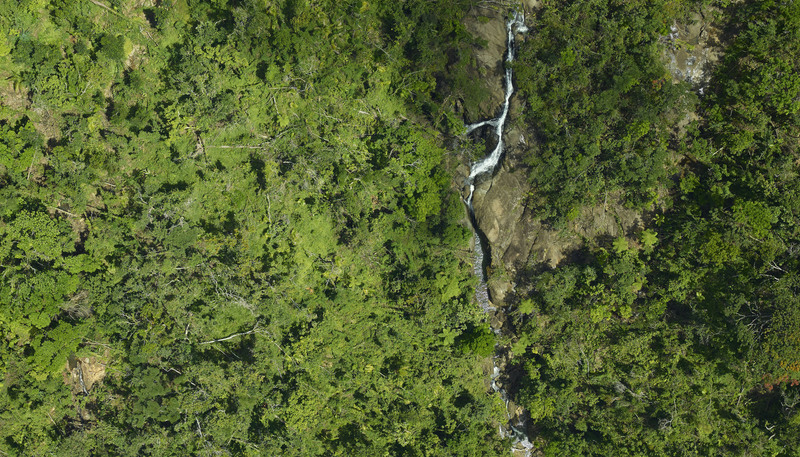 This April and May, a team of our scientists took to the air to take three-dimensional images of Puerto Rico’s forests using Goddard’s Lidar, Hyperspectral, and Thermal Imager (G-LIHT), which uses light in the form of a pulsed laser. By comparing images of the same forests taken by the team before and after the storm, scientists will be able to use those data to study how hurricanes change these forest ecosystems. One word defines the post-hurricane forest canopy in El Yunque National Forest: Open. “The trees have been stripped clean,” said NASA Goddard Earth scientist and G-LiHT co-investigator Doug Morton, who returned to the forest in April to gather measurements of trees on the ground to complement the airborne campaign’s lidar work. He was there a year ago, months before the hurricanes would ravage the area. He pointed out that from the mountainside he could see downtown San Juan, which is 45-minutes away by car. And no canopy means no shade. “Where once maybe a few flecks of sunlight reached the forest floor, now the ground is saturated in light,” Morton said, adding that such a change could have profound consequences for the overall forest ecosystem. For example, some tree seedlings that thrive on a cool forest floor may whither now that daytime temperatures are as much as 4 degrees Celsius (7 degrees Fahrenheit) hotter than they were before the hurricane. Meanwhile, as we shall see, other plants and animals stand to benefit from such changes. “Who are the winners and losers in this post-hurricane forest ecosystem, and how will that play out in the long run? Those are two of the key questions,” said Morton. The secret to their survival: Biomechanics. “The palm generally doesn’t break because it’s got a flexible stem—it’s got so much play,” Uriarte said. “For the most part, during a storm it sways back and forth and loses its fronds and has a bad hair day and then it’s back to normal.” By contrast, even neighboring trees with very dense, strong wood, like the Tabonuco, were snapped in half or completely uprooted by the force of the hurricane winds. Rising noticeably from the post-hurricane forest floor of El Yunque National Forest are woody vines called lianas. Rooted in the ground, their goal, Morton says, is to climb onto host trees and compete for sunlight at the top. That, combined with the fact that their weight tends to slow tree productivity potential, means they are literally a drag on the forest canopy. As lianas can wind their way around several trees, regions with more of these vines tend to have larger groupings of trees that get pulled down together. The Iguaca is the last living native parrot species of Puerto Rico. Deforestation from agriculture brought the population to its knees, but as forests have reclaimed much of the land over the past 50 years, the U.S. 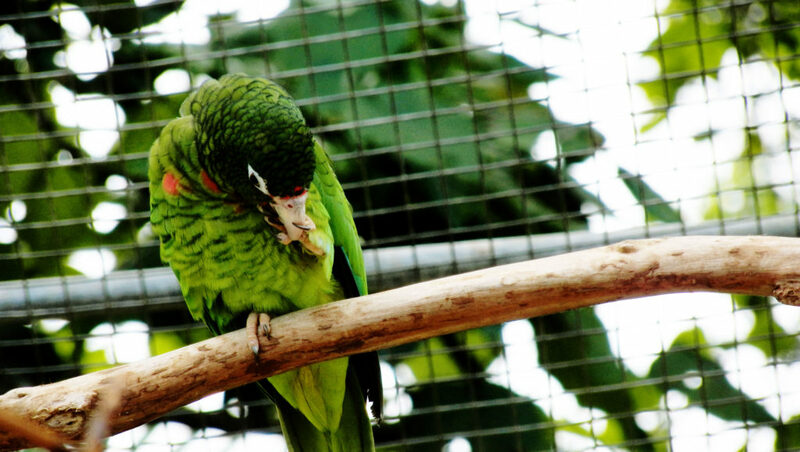 Fish and Wildlife Service’s Iguaca Aviaries have been working to restore their numbers by breeding and releasing the parrots into the wild. The island’s two Iguaca aviaries have reported a substantial number of deaths in the wild due to the hurricanes. In the forests of Río Abajo, in western central Puerto Rico, about 100 of the roughly 140 wild parrots survived; in El Yunque National Forest in the eastern part of the island, only three of the 53 to 56 wild parrots are known to have pulled through. “It was a huge blow,” said the U.S. Fish and Wildlife Service’s Tom White, a parrot biologist stationed at the aviary in El Yunque, which took the brunt of Hurricane Maria’s Category 5 winds. Some of the parrots died during the storm—from being thrashed around or being hit by falling tree limbs, for example, while others likely died from increased predation from hawks because there were no longer canopies for them to hide in. The rest succumbed to starvation. 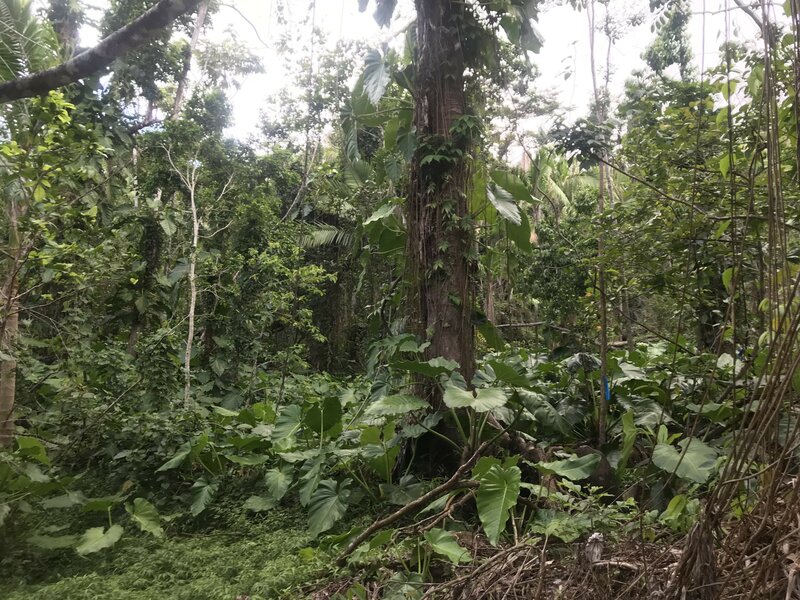 The Iguaca subsists on flowers, fruits, seeds, and leaves derived from more than 60 species—but for several months following the storm, the forest was completely defoliated. When Hurricane Maria stripped the leaves off of trees, changes in the forest microclimate instantly transformed the living conditions for lizards and frogs. 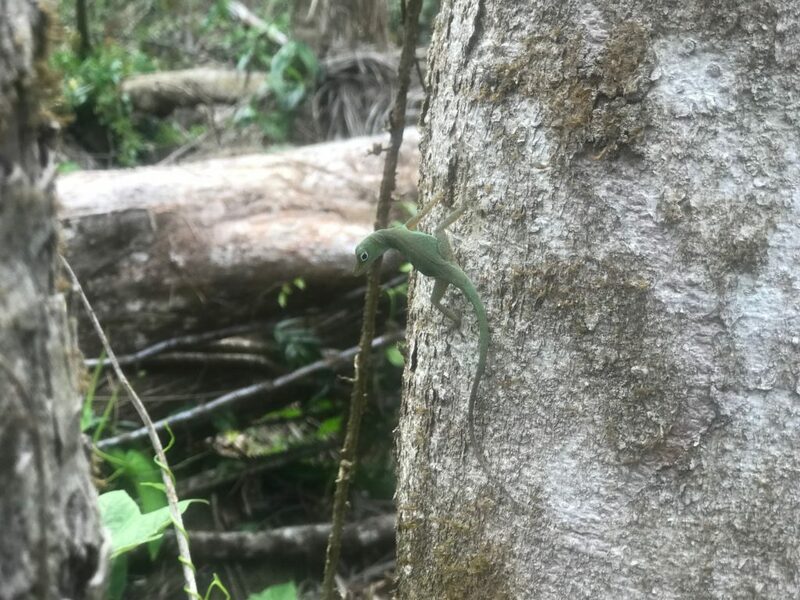 Species have reacted differently to the event based on the conditions they are adapted to, said herpetologist Neftali Ríos-López, an associate professor at the University of Puerto Rico-Humacao Campus. 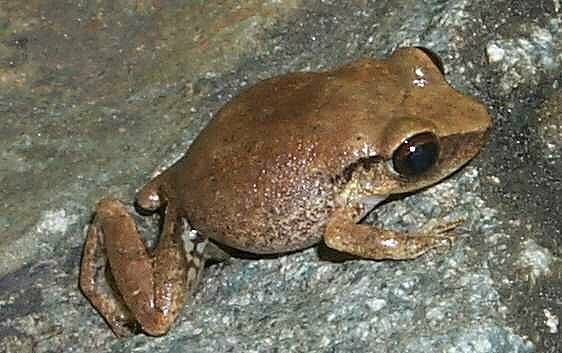 Coqui frogs, notable for their bisyllabic chirps, are the dominant frogs in Puerto Rico, which is home to 17 coqui species. Among them, the red-eyed coqui, with its resistance to temperature and humidity fluctuations and its ability to handle dehydration better than other species, has benefited from the warmer, drier conditions in the forests after the storm. Traditionally a grassland species, they are expanding from the lowlands to the middle and higher parts of the mountains, Ríos-Lopez said. “Physiologically, what was a disadvantage for that species when the whole island was forested now finds itself in a positive position.” Conversely, forest-acclimated coqui frog species have declined. That said, as the forests recover, so will many of the species whose numbers have dwindled following the storms. “It will take many years, decades, I would guess,” Ríos-Lopez said. 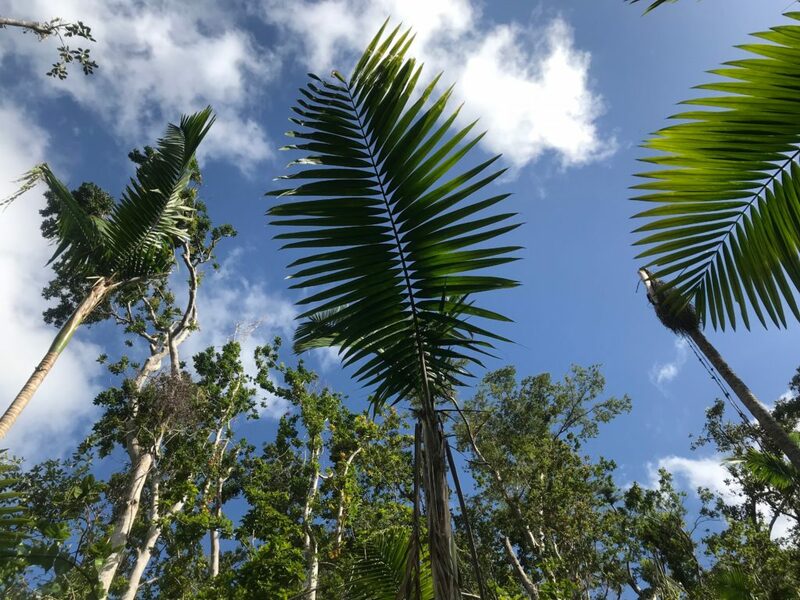 Our scientists are working with partners from universities and government to use G-LiHT data to inform ground research on forest and other ecosystems not only in Puerto Rico but also throughout the world. To follow their campaigns and keep up with the latest news, find them here: https://gliht.gsfc.nasa.gov. The most important question at the daily briefing for NASA’s Atmospheric Tomography, or ATom, mission is: What are we flying through next? For the 30 scientists plus aircraft crew loaded up on NASA’s DC-8 flying research laboratory on a 10-flight journey around the world to survey the gases and particles in the atmosphere, knowing what’s ahead isn’t just about avoiding turbulence. It’s also about collecting the best data they can as they travel from the Arctic to the tropics then to the Antarctic and back again. “ATom is all about the up and downs,” said Paul Newman, lead of the ATom science team and chief scientist for Earth Sciences at NASA’s Goddard Space Flight Center in Greenbelt, Maryland. The ups and downs he’s referring to are slow descents from 40,000 feet to 500 feet above the ocean so the researchers aboard can sample the atmosphere at all altitudes in between. That’s not a maneuver the pilots will do if they can’t see what’s below or ahead of them, but the measurements are why the team is out there. Which is why to find out what they might encounter and safely plan their flight path, it takes a team back home in their offices supporting them with freshly downloaded satellite data, updating forecasting models, an internet connection and phone. The pre-flight briefing takes place at 9 a.m. where the plane is, so for the forecasters calling in from Colorado, Virginia, and Maryland, it often means working late or early to brief the mission scientists and pilots at their hotel. And then when the flight takes off, one of them is in the plane’s private satellite chat room giving them live updates while the plane is in the air. Weather is of course the big concern. The pilots of the DC-8, which in another life was a mid-sized passenger plane, need to know where the fair and foul weather is. Weather isn’t the only forecast the team gets before and during the flight. They also get a forecast of the atmospheric chemistry. From supercomputers at Goddard, a computer simulation of Earth projects the paths of carbon monoxide plumes. Carbon monoxide is one of over 400 gases being measured aboard the DC-8, but since it’s the result of incomplete combustion, whether from cars, power plants, wild fires or agricultural fires, it’s one of the simplest for the computer to track. Like a weather forecast, the chemical forecast takes current satellite data of carbon monoxide and then uses winds and temperature to project where it will go into the future – and where the DC-8 aircraft might encounter it on flight day. 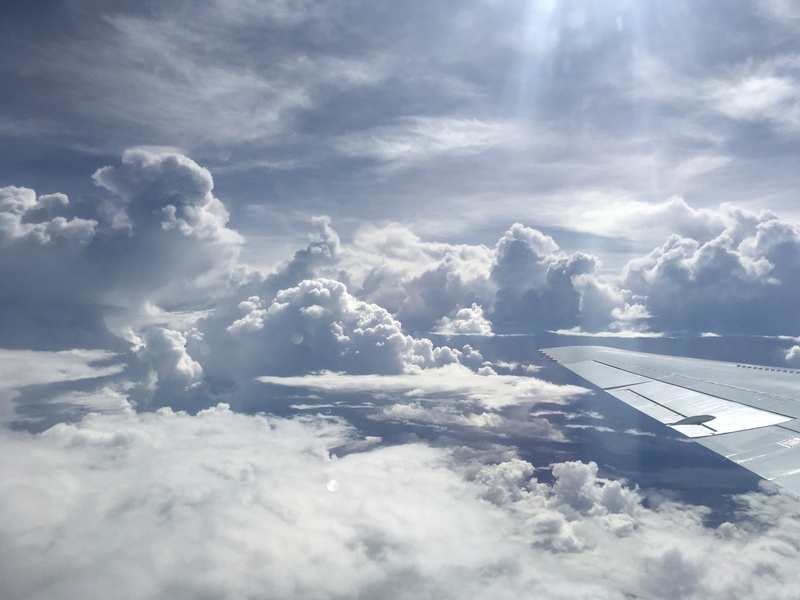 “It’s fun to see during the flight whether or not some of these forecasts are realized,” said Julie Nicely of the chemical forecast team. “The person who measures carbon monoxide, for instance, might get on the chat and say, ‘Oh, we just saw CO [carbon monoxide] rise right where you said it would! '” Where turns out to be the easier question to answer. How much of it there is and what other gases occur with and react with it to turn into other gases are much more difficult questions and are among the reasons ATom’s science team is flying through these plumes of pollution. Carbon monoxide isn’t the only gas whose intermingling with other atmospheric chemistry is being studied. When Nicely’s not supporting ATom she’s researching the hydroxyl radical, a chemical that lasts for a fraction of a second before reacting with other gases in the constantly churning chemistry of the atmosphere. It’s impossible to simulate in the model at the moment, and ATom’s flights are the first time its concentration, along with hundreds of other gases, is being measured on a global scale. 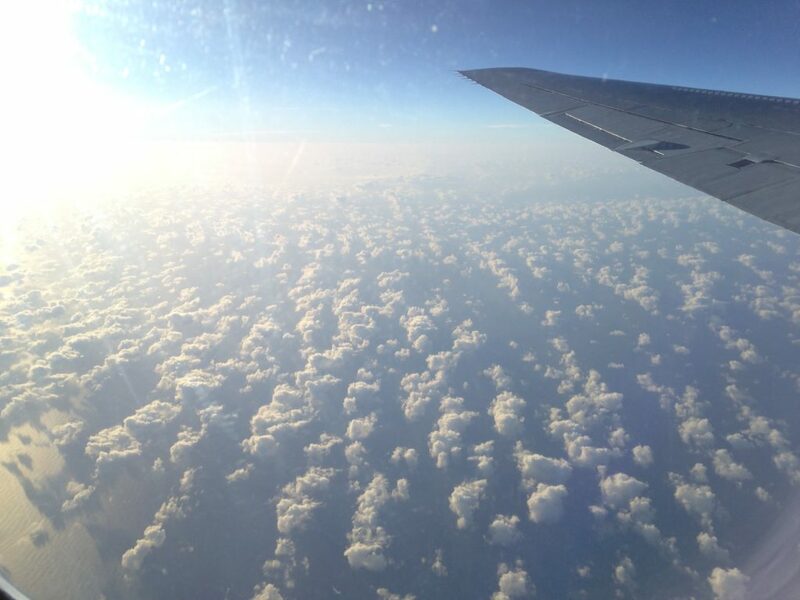 What the science team learns from these flights will go toward not only understanding the chemistry along the strip of the ocean their plane flew over but also improving the atmospheric chemistry models that are a tool for looking at what’s happening across the entire globe. Team Sea Ice or Team Land Ice? 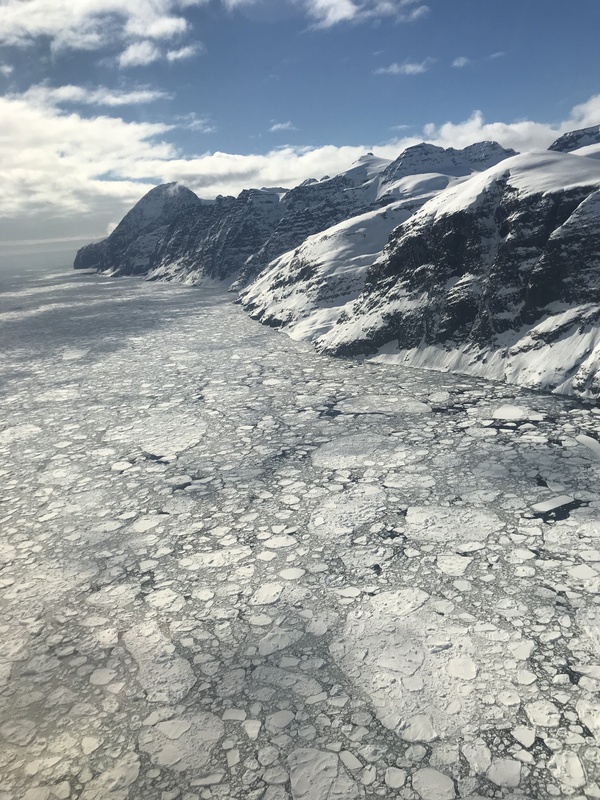 Linette Boisvert is a sea ice scientist at NASA’s Goddard Space Flight Center in Greenbelt, Maryland, and researcher with Operation IceBridge. The mission of Operation IceBridge, NASA’s longest-running airborne mission to monitor polar ice, is to collect data on changing polar land and sea ice and maintain continuity of measurements between ICESat missions. 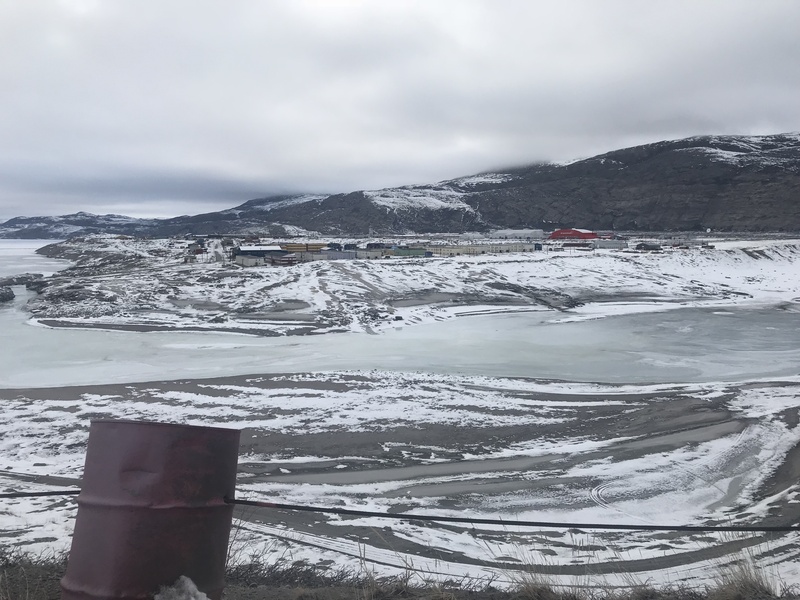 I am lucky enough to get to travel to Kangerlussuaq—a small town on the southwestern coast of Greenland that means “big fjord” in the Kalaallisut language—to join NASA’s Operation IceBridge for the remainder of their Arctic spring campaign. I landed in Kanger on the morning of Friday, April 20, after leaving Washington, D.C., Wednesday evening, flying and overnighting in Copenhagen, Denmark, and then taking an Air Greenland flight, crossing the Atlantic Ocean twice in less than 36 hours. (Fun Fact: Greenland is owned by Denmark, so flying through Copenhagen is the only way to get to Greenland commercially.) The flight was on an Airbus, which had a surprisingly large number of passengers aboard. After landing I thought, hmm, why do all of these people want to go to Kanger? Kanger is a small, roughly 500-person town comprising buildings surrounding the airport. 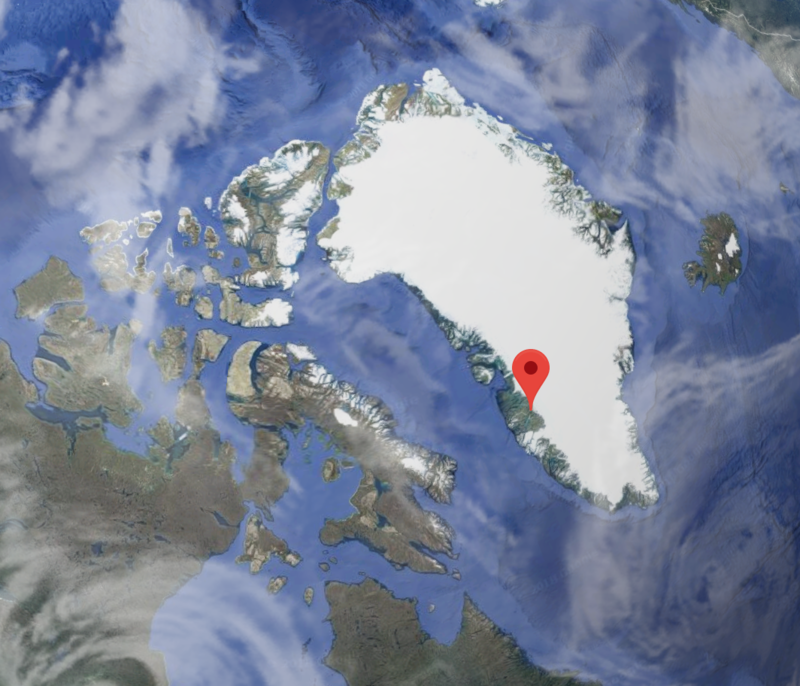 There is a grocery store, a coffee/ice cream shop that never appears to be open, a youth “jail” for all of Greenland, and a Thai restaurant that is known for its pizza. Odd. Regardless, Kanger is pretty, being situated in the fjord valley with a river running through it, although currently it is frozen solid. It is also warmer here than I would have expected for Greenland, with highs in the upper 20’s to low 30’s. 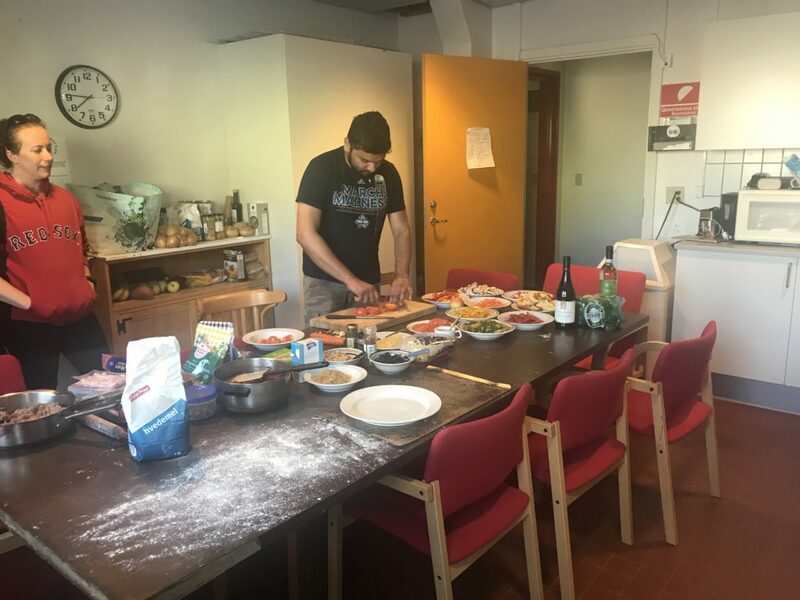 For the rest of the campaign, until May 4, I will be in Kanger, with the rest of my “OIB family,” as I call them, living in dorm-style housing and cooking family-style dinners together just about each night. 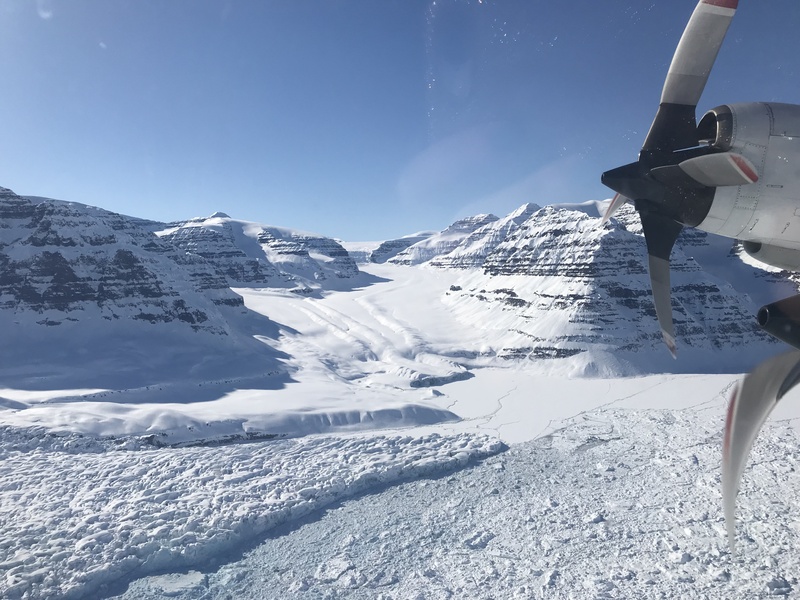 April 21 was our first science flight out of Kanger, and as with the rest of the flights from here, it was a land ice flight. 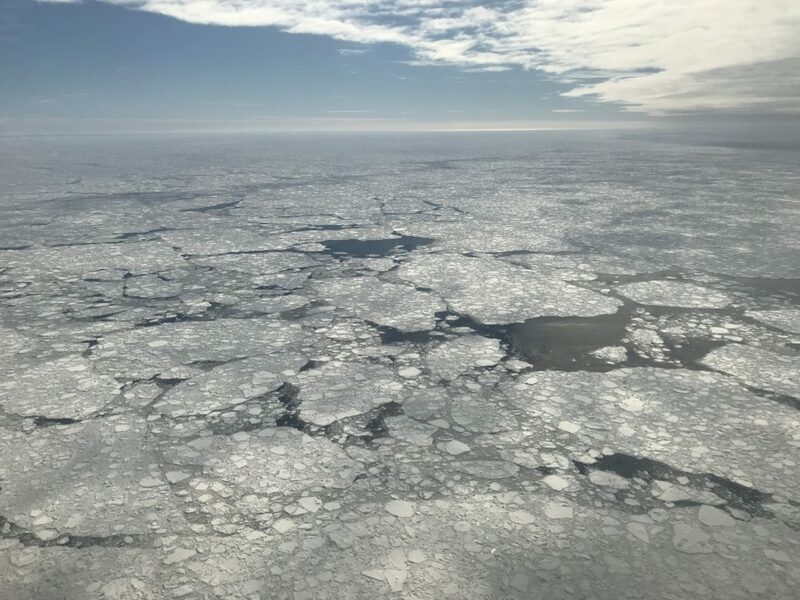 Sidebar: I am a sea ice scientist and have never been on a land ice flight before. There is a friendly rivalry between the land ice and sea ice scientist community (go Team Sea Ice! ), and it is clear here that I am the only sea ice fanatic aboard, so I get picked on a bit. For those of you who don’t know, sea ice is frozen seawater that floats around on the ocean, and land ice is snow that is compacted over many, many years and turns into ice and is located on the bedrock of Greenland. Sea ice = salty (good in a margarita), while land ice = fresh (good in a smoothie). It is not surprising to say that they really wanted to convert me to Team Land Ice, and they couldn’t have chosen a more scenic flight for this attempt. 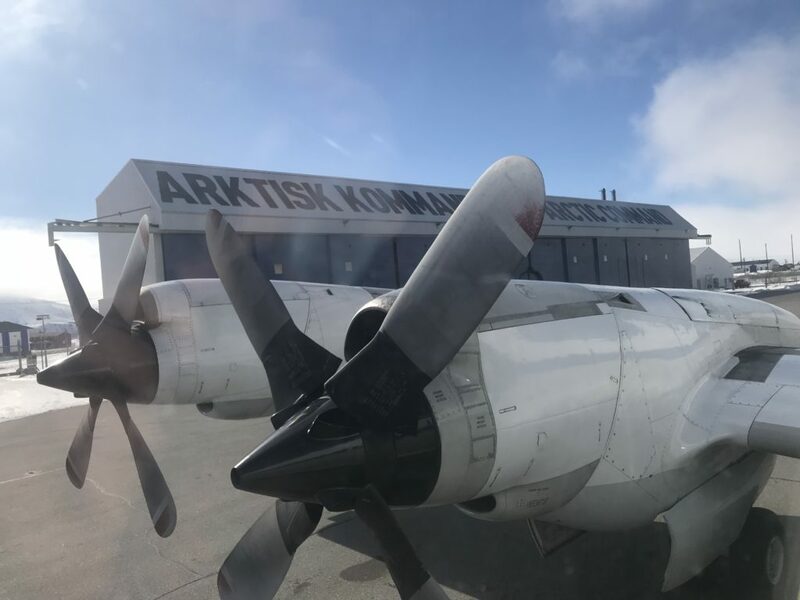 The flight is named Geikie 02 and highlights eight glaciers on the Geikie Peninsula on the eastern coast of Greenland. 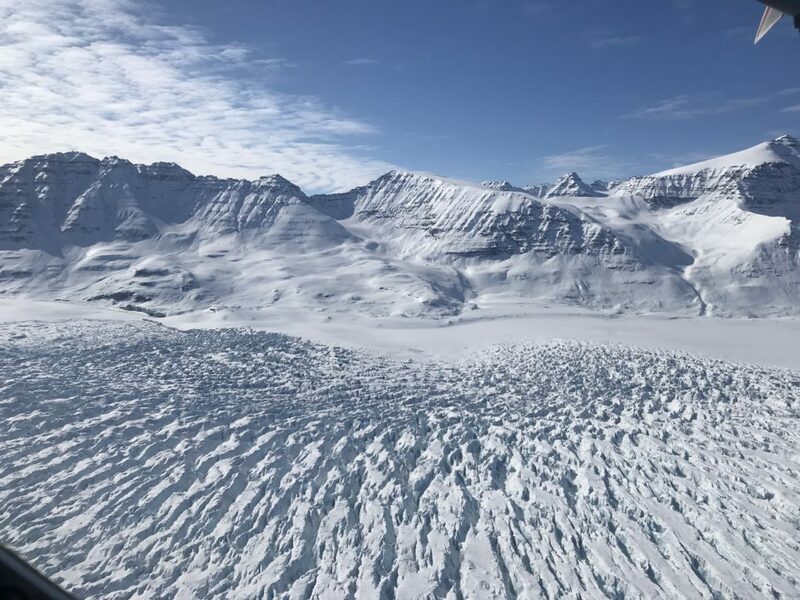 Glaciers are slow-moving rivers of ice, where land ice from the Greenland Ice Sheet is transported into the oceans or sea ice pack depending on location and time of year. As the ice gets forced into these channels and around bends, it cracks, making crevasses, similar looking to crocodile skin (or the skin on your elbow) at times. These glaciers have carved out deep channels and fjords in the bedrock over time, making for awe-inspiring views and terrain, especially when you are flying in the P-3 plane at just 1500 feet. There were many times where I would look out the window and see mountains reaching high above us as we flew over the glaciers deep in the fjord valleys and other times where it felt as it we were just skimming the tops of the mountains. This is not something that normally happens on commercial airline flights and is not for the faint of heart, but it is spectacular to behold, and I felt truly lucky to be able to witness this magnificent place. As we flew out of the fjord to where both land ice and land meets sea, I instantly became overjoyed to view the sea ice (go Team Sea Ice! 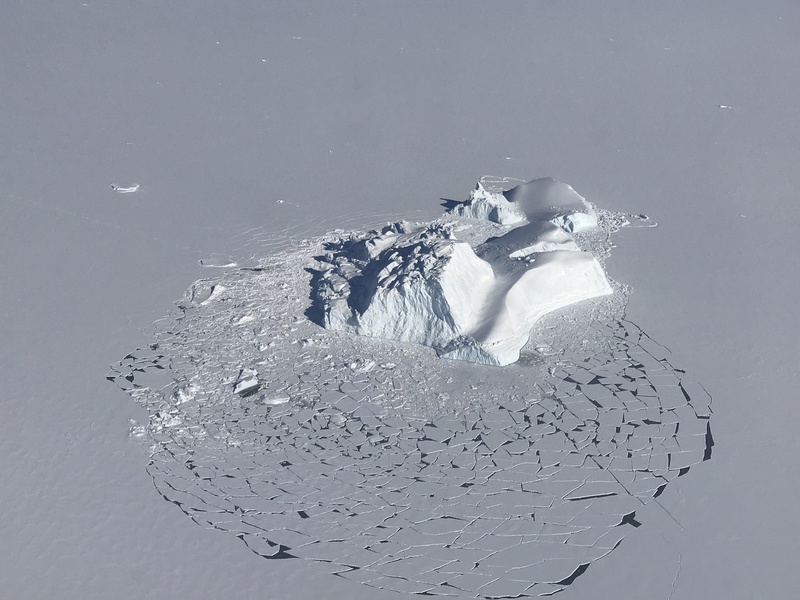 ): all thicknesses, broken up, ridged, consolidated and flooded along with numerous leads and icebergs, which are land ice deposited into the ocean from the glaciers. Sea ice on a land ice flight? I think I could get used to this. As we crossed the fjords and the sea ice, we noticed multiple polar bear tracks in the snow (likened to a “polar bear highway”), and multiple holes in the sea ice where seals will come out for air and rest. A few people even claimed they saw a polar bear running on the sea ice after being startled by our plane flying over, but I didn’t see it and I am skeptical. 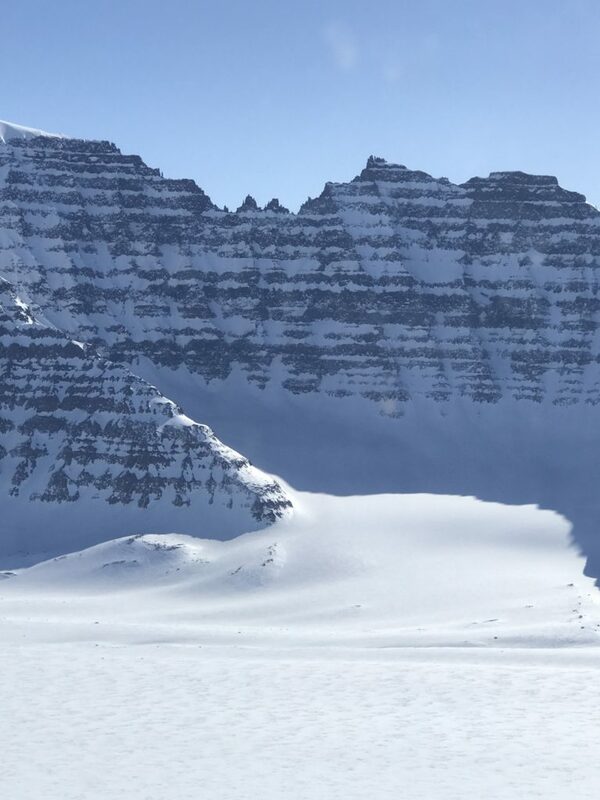 Another highlight of this flight was flying past Greenland’s tallest mountain, Gunnbjorn, which rises 12,000 feet, and the “Grand Canyon of Greenland” – the one not covered by kilometers of ice in the center of the ice sheet that data from a previous IceBridge campaign had recently discovered. Needless to say, I was glued to my window for the majority of this flight. These pictures just don’t do them justice. 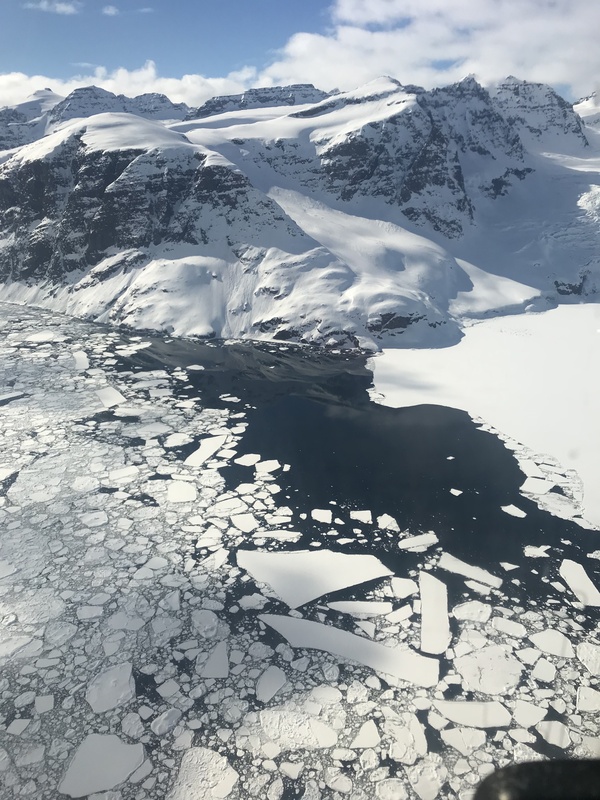 Although this flight did not convert me to Team Land Ice, it did reiterate to me that all ice types matter, especially in the broader context of climate change, and it is the main reason for the IceBridge field campaign: to repeatedly gather data of both land and sea ice to determine where, how, and why both ice types are changing. Specifically, melting land ice flows into the ocean and contributes to global sea level rise, whereas the loss of sea ice affects ocean and atmospheric circulation patterns both locally and globally, reminding us that what happens in the Arctic doesn’t stay in the Arctic.